Prime Minister Voreqe Bainimarama is impressed with the preparations that have been undertaken for COP23 – the largest ongoing UN negotiations on climate change. Bainimarama visited the site for this year’s COP at the World Conference Centre in Bonn, Germany where he will assume its presidency from the current COP presidency, Morocco. He also inspected the Fijian “Drua” located in the main hall in the conference centre. 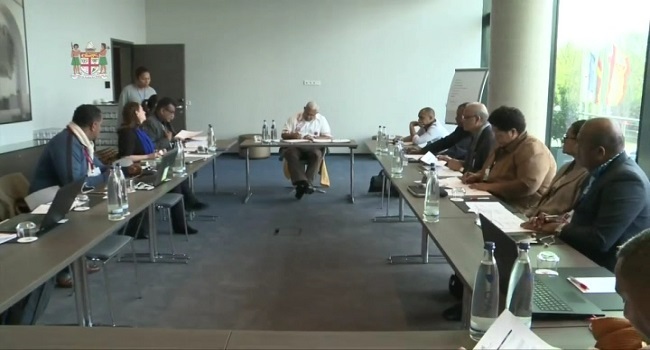 As incoming president, Bainimarama was briefed by senior officials from both the COP23 Secretariat and the government on the logistics for Fiji’s presidency. Following the briefing, the PM was taken on a tour of the Bula Zone where both plenary and negotiation sessions will take place. He also visited the Presidency office where he will work from in the next few weeks. COP23 officially begins on Monday however, Bainimarama will hold meetings prior to this opening.